With her undeniable talent, she got herself into the Top 50 of Lilla Rogers’ Global Talent Search, and below are two of her submissions. As you can see, she always has a character or two in her work that are so much fun. Please check out her website to see more of her work! I have only became serious with art and illustration earlier in 2014 when I joined Lilla Rogers’ Bootcamp and MATS (A) classes. So in a way I am a newbie, and I don’t have a lot of exciting projects going on. Recently I have just finished my journey in the Lilla Rogers’ Global Talent Search. I was lucky enough to get into the top 50 for the second round, but didn’t advance to the final round. My plan of becoming one of Lilla’s artists will be put on hold for now! I am also working on developing a portfolio for children’s arts and products, and I am getting ready to send out my work to a few potential companies and children’s book publishers. I may also try to seek representation from an art or literary agent, as it is my dream to illustrate for children’s story books. I am also hoping to establish my Etsy shop soon. I always like to instill a bit of story and humor in my work whenever possible. I want to make people laugh, and I want to touch their hearts when they are not laughing. I hope that sets me apart somewhat! Other than that, my 2.5 year old son is the center of my universe at the moment, so I tend to enjoy more on creating art that has a boyish flare / humor in it. 3. Why do I create? Wait…. are you implying there is a way of life where people don’t create? I would read and understand the assignment, and possibly ask as many questions as I can to understand what my client wants. I will then spend a block of time on researching and developing a concept, looking at as many reference images as possible. I may get a reference mood board together. Then, I sketch my ideas with pencil on paper. If I am creating a vector illustration, I will scan my sketches and trace them in Adobe Illustrator. It is pretty straight forward. I may add in textures later in Photoshop. If I am drawing them with a brush, I will re-draw my favorite sketch(es) a selected paper stock, and then I paint. My usual favorite medium is watercolor. I tried gouache too but I haven’t been able to like it. Sometimes I actually scan and briefly trace and define my colors in Illustrator first before painting. It is super time-consuming so I am hoping eventually I can streamline this process a bit and work faster. I will then scan and composite my final composition in Photoshop. 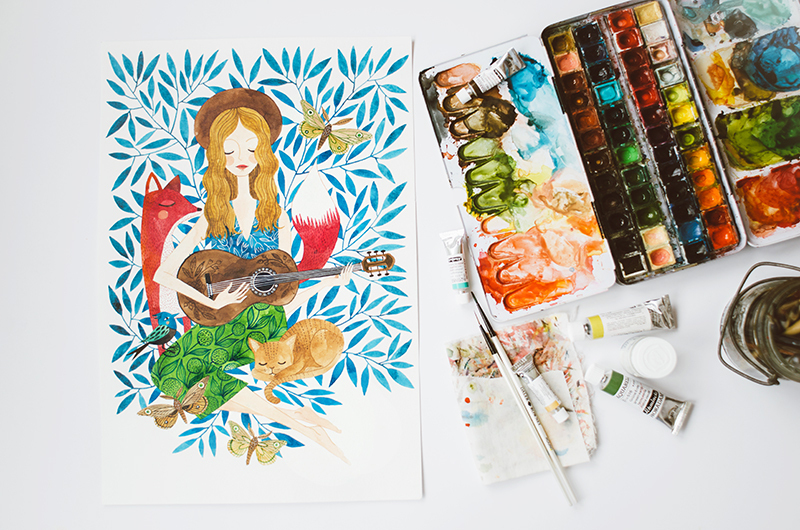 I have so many artists that I find inspiring, and I want to introduce you to three of them! First there is Amber Goodvin. I know about Amber from Lilla Rogers’ MATS (A) class, and I’ve been obsessed with her work since. She is a lettering artist and illustrator at Hallmark, and her work is beyond beautiful! She is currently living in Lawrence, KS with her family, and she teaches handlettering to design students. I love how her work always have that authentic and handmade quality to it, and her style is always refreshing. With her art and illustration, she has a way with simplifying her subject matter into very simple and organic shapes and forms, with very warm handmade textures. Here are some samples of her illustration and hand lettering work. She is also the reason why I even wanted to try hand lettering myself! You can see more of her work at her website. Then there is my idol Oana Befort. I came to know about Oana through a previous client of mine, and I have been so intrigued by her work since! She is actually one of the reasons why I was interested in trying watercolor myself in the first place. 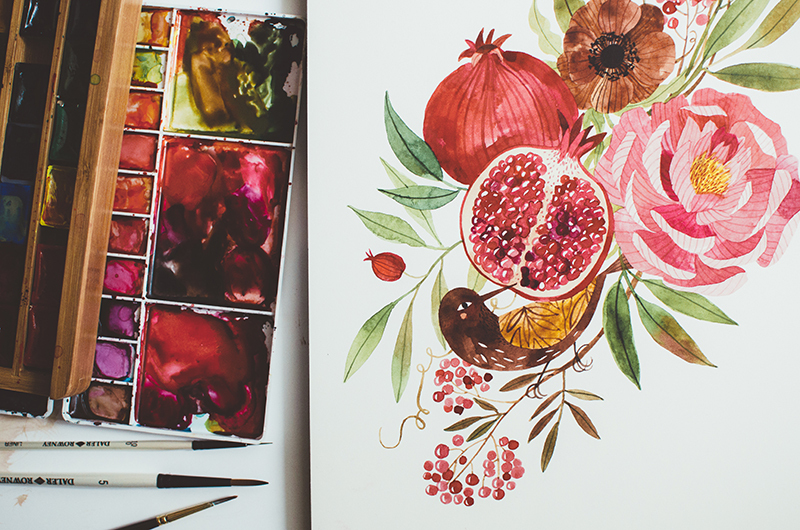 She paints a lot of flowers and beautiful animals within her bouquets, and her watercolors are so detailed. Her subjects are always filled with beautiful complex textures that just makes everything even more amazing. On top of that, she does beautiful hand lettering as well. How can anyone not love her work? See more of her work at her website! Last but not least, I want to introduce one more artist: Lucky Nielsen. I am breaking the rule here. When I first got in touch with her to ask for her permission to feature her work on my post, she told me she was actually tagged the week before, and her blog post would come out the same time as mine! Well, I am just going to feature her anyway because I love her work so much! Besides, everyone within our bootcamp group seemed to have had a post done already! I knew Lucky through my MATS (A) and Bootcamp classes, and have became a big fan. She was also one of the semi-finalists on Lilla’s Global Talent Search. I was so shocked and saddened that she didn’t get into the final round (I liked her entry more than mine, haha). That was when I go look at her blog, and thought she hasn’t done the blog hop yet. I believe most of her work are done with vector/illustrator, yet she applied beautiful textures within her illustrations that make them very intricate and interesting. Her colors and her style convey a retro yet modern look, which is very attractive to look at. She is also very good at designing characters, her characters always have a strong sense of personality within them! On top of that, she also make these needle felted characters and art. Deliciousness! What else can’t she do? You can see more of her wonderful world at her website. So there it is boys and girls, I hope you enjoyed this post! This entry was posted in Art, Design, Illustration, Inspiration, Work and tagged art, artist, artist blog hop, artists around the world, blog hop, design, global talent search, GTS, illustration, inspiration, Lilla Rogers, Make Art That Sells, MATS, MATS assignment bootcamp. Bookmark the permalink. great choices and such inspiring work by you and all the artists above! So glad you like this post Barbara! Super inspiring. Your post has such a fun and happy tone to it! Supper hippo and cutie mouse smelling roses were 2 of my favorites from that round of GTS. Good to know you enjoy this post and find it inspiring!